When it comes to working out, there are a lot of obstacles. It’s hard to find the routine that’s right for you. Once you do, it’s a lot of work to get the results that you want. Sometimes the hardest part is finding the time to get to the gym on a regular basis. After all, if you spend an hour at the gym and take 30 minutes to get there and 30 more to get home, we’re talking about 2 hours. That’s before thinking of showers, changing, and talking to that one guy who hangs out by the bench press and always has jokes to try out. We make sacrifices to find the time, which means we lose time with coworkers, friends, and family -- all in the name of staying fit. Wouldn’t it be great if we could remain in shape without committing so much of our free time? Wouldn’t it be great if you could lose weight, stay trim, and not even leave your home or office? Researchers found that high impact, focused workouts can yield the same or better results than more time-consuming endurance exercises. In particular, scientists have seen an uptick in metabolism, weight loss, and even, potentially, life span. 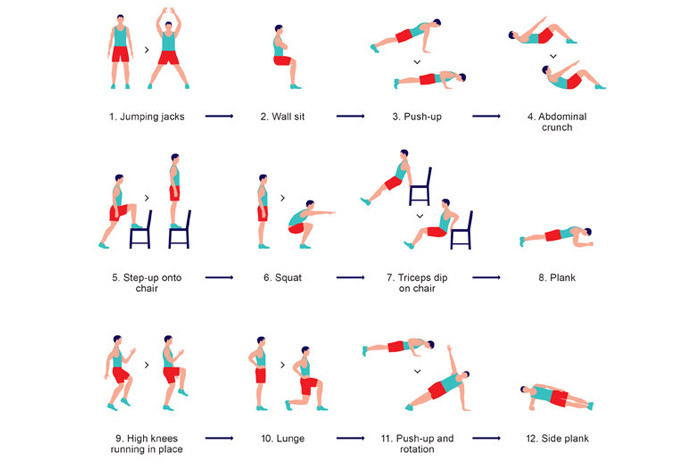 You might remember the Scientific 7-Minute Workout after it went viral in 2013, but when was the last time you tried it? This famous workout uses your body weight and gravity in 12 distinct exercises to yield maximum results. So how does it work? By using your body weight and leveraging gravity, this routine puts intense pressure on your muscles for a high impact workout. Studies show that forcing your muscle cells to adjust to a sudden increase in pressure helps to quickly build stronger, leaner muscles. It also accelerates your body’s fat burning processes. Although it’s not always easy to start a new routine, squeezing 7 minutes into your schedule is do-able for just about anyone. What makes it even easier is that there are apps that provide you with records of your progress, a calendar scheduling your workouts, and full step by step guidance. With all of that at your fingertips, it’s never been easier to change your workout routine and start opening up your schedule. Just seven minutes a day can replace that two hour trip to the gym and get the same amazing results. What are you going to do with two more free hours? Now’s the time to start thinking about getting a new hobby.